Welcome to Day #6, our final day of sneak peeks for the September release! I hope you've loved all of the new sets and cards you've seen this week! Today's release is super fun because it's a new set of Fri-Dies! Yay! 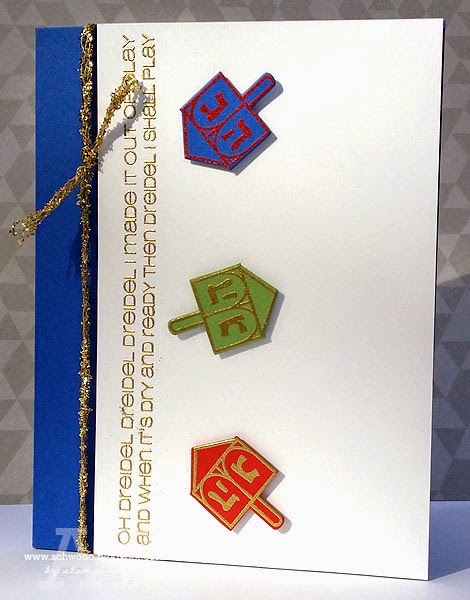 Michele has created Hanukkah Fri-Dies to coordinate with the 8 Happy Nights stamp set! The dies include a dreidl, a number 8, and a multi-pieced Star of David. For my card, I used the dreidel die, and oh, how easily and perfectly it worked! I used gold and red embossing on the different colors of card stock, love how it pops! Be sure and head over to the blog to see the awe-inspiring ideas from the rest of the Girl Fridays and leave a comment to win some goodies for the week! I can't wait to see what amazing projects you come up with using the September releases! Cardstock: SU Whisper White, Brilliant Blue, Real Red, Wild Wasabi. 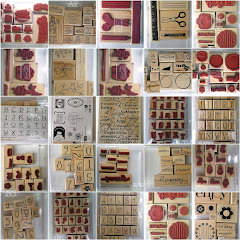 Accessories: CAS-ual Fridays Stamps Hanukkah Fri-Dies, gold & red embossing powder, heat tool, Studio Calico kit gold trim. This is very cute and totally playful!